RevK®'s rants: A keyboard feeling the cold? I have had a rather bizarre issue over the last few weeks. In my home office I have air conditioning. Sadly the window for the "auto" mode is too wide for my liking so I set to cooling in summer and heating in winter. Annoyingly, as I have blogged before, some times it is heating in morning and cooling in evening, which is not ideal. Over the last few weeks, some days, it has been warm in here. It is just me, a Mac, and a linux box heating the place, but even so it has got to evening and started to be 22C or 23C so I have set to cooling. If I set to cool last thing in evening then in the morning it has been cold. Though today, it was 19.5C with no heating all night which is crazy. But last week it was down to 13C. I noticed an odd effect. My keyboard! It would not work in the morning, and over a period of a couple of weeks I confirmed it was actually temperature related! Below around 17C the space bar would not work. Get down to 13C and you are losing a few more like the 8 and 5 keys. I don't know what to say?! It makes no sense. I literally had to wait for the room to warm up before it started working?! Even with that craziness, we are at the winter solstice just a few hours ago (about 25 I think) and I am switching my air conditioning to cool. WTF? Dry solder joint or hairline crack somewhere - perhaps even inside an IC. I've also seen this sort of thing where a connection which should have been soldered (e.g. the leg of an IC) be missed during (presumably hand) assembly leaving it just resting on a PCB pad, sometimes making contact, sometimes not. Our Edinburgh office has storage heating, which is often set to the temperature you wanted the day before. It was roasting the other day and my colleague had to put the fan on. I see that you have a Unicomp keyboard. It's not your heating, it's the keyboard. Buy a replacement, but not another Unicomp. 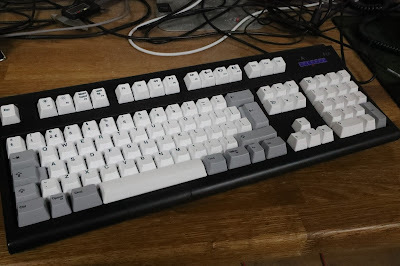 My Unicomp is also unreliable, and I have seen enough reports of other people having problems with them that it's clear that corners have been cut and they're coasting on the reputation of the old IBM Model M's buckling-spring switches. Mine has been relegated to the server-rescue keyboard when I need to get at the console of a usually-headless box. It's just about up to that task. These days, keyboard aficionados rave about Cherry MX switches. The switches are colour-coded to show activation force and whether they are clicky, and green is apparently most like buckling spring. I suggest you wander into PC World or wherever and have a feel of the various premium (probably gaming) keyboards there which use Cherry switches so you know which colour you prefer. I've had trouble with my Unicomp keyboard too and their UK retailer, The Keyboard Company in Stroud, Gloucestershire. Bought it and all was fine for 10 months. Then large numbers of keys just stopped working one morning. Not good enough on a product only 10 months old. Contacted The Keyboard Company and told them I wanted a replacement and I sent it back to them. Then they refused to reimburse my £26 of shipping costs. They seemed to think *I* should have to pay up to get *their* failure remedied. Then they just sent the same keyboard straight back to me with no client communication. I checked the serial numbers: it was the same one. So, I complained again. They claimed to have repaired it and indeed it did work again. But not a good experience of the Unicomp product and not a good experience of The Keyboard Company either. I won't go near that firm again. Reminds me of an old CD player we used in the garage - you had to start on Track 5, let it run for a while and only then could you go back and play Tracks 1-4, it wouldn't read them otherwise! Further to Peter's comment above, for anyone interested in buying a Cherry switch equipped keyboard, there are some useful and reasonably-priced testers available which allow you to try the various switches, each of which has quite distinct characteristics. Don't make the mistake of thinking that it doesn't matter which colour you buy! The switch tester linked to below is reasonably priced and includes the blue and brown switches beloved by touch-typists, a green (mentioned above: a clickier version of the blue with a greater required actuation force) and the gamers' favourite, red. These tester kits are no substitute for typing on a full keyboard of course, but they give you a good idea of the characteristics of each switch (including the infamous acoustics of the clickier colours). Speaking of decibel levels, it's worth pointing out that the nature of the construction of most keyboards muffles the 'tick-tick-tick' click of switches like the blues and greens. However, most of these tester kits have no surrounding bezel and have only the key caps to shield the user from the sound of the switch mechanisms. As a result, the 'tick' from the blues and greens in particular can sound alarmingly loud. As I know from experience having both a tester kit similar to the one above and a Das Professional with Cherry blues, the noise is not quite as intrusive when the switches are mounted within a proper keyboard chassis and are thus somewhat baffled as a result.